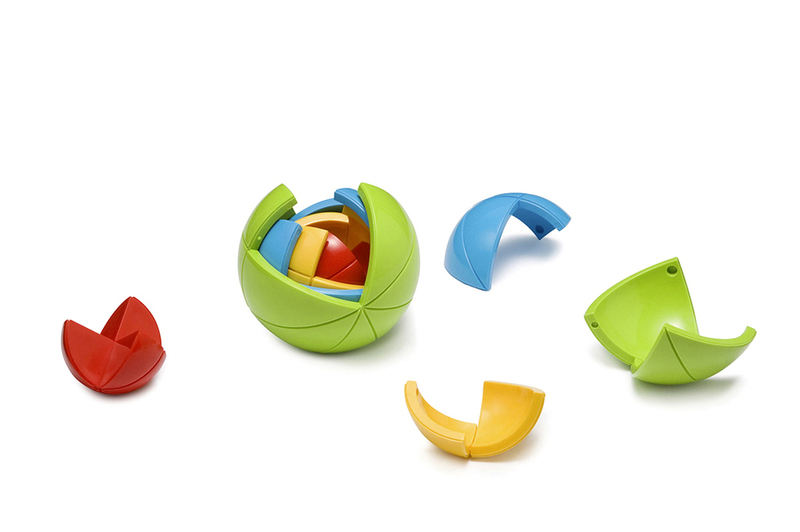 OBLO is an award winning 3-D spherical puzzle that challenges and inspires children of all ages. 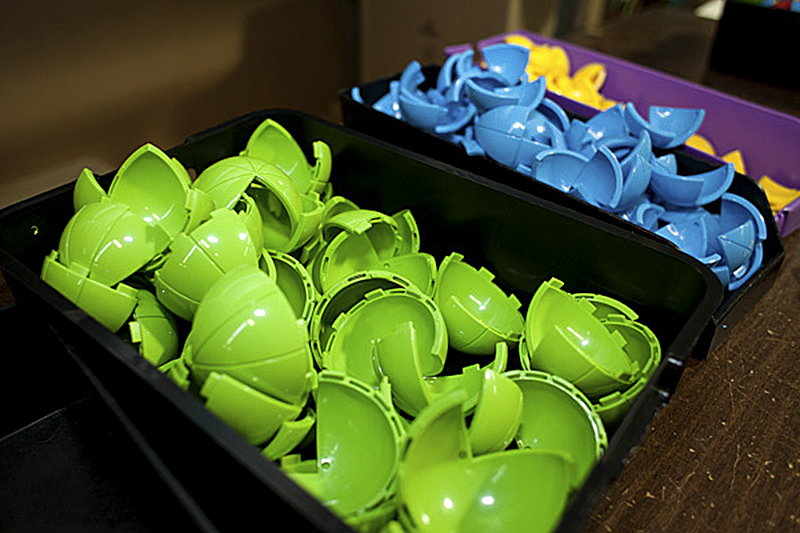 Numerous educational theories recognize tactile play as a powerful learning tool. Through its design, OBLO spheres, a spherical didactic puzzle, manifests those theories and blurs the line between play and learning. 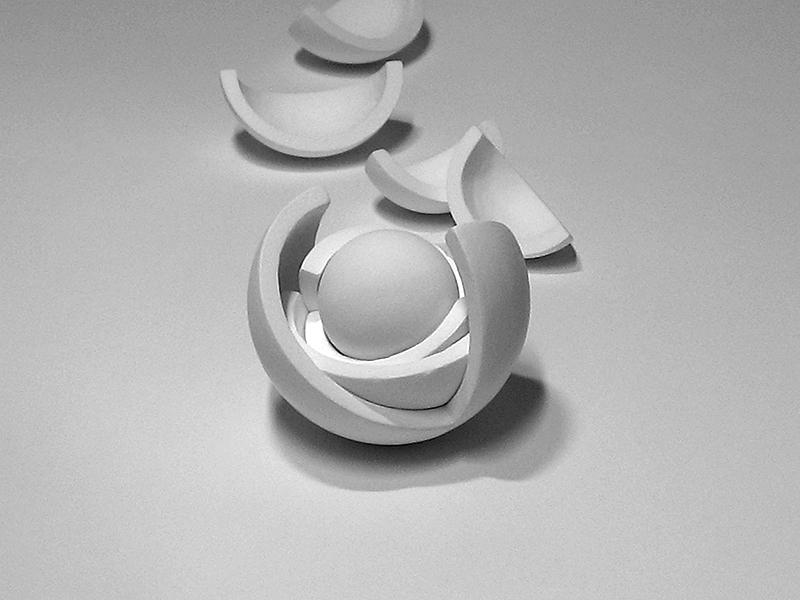 The shells must be twisted against the sphere's central axis in order to successfully remove individual pieces from the center of the ball, until all pieces have been removed and the OBLO spheres has been entirely disassembled. 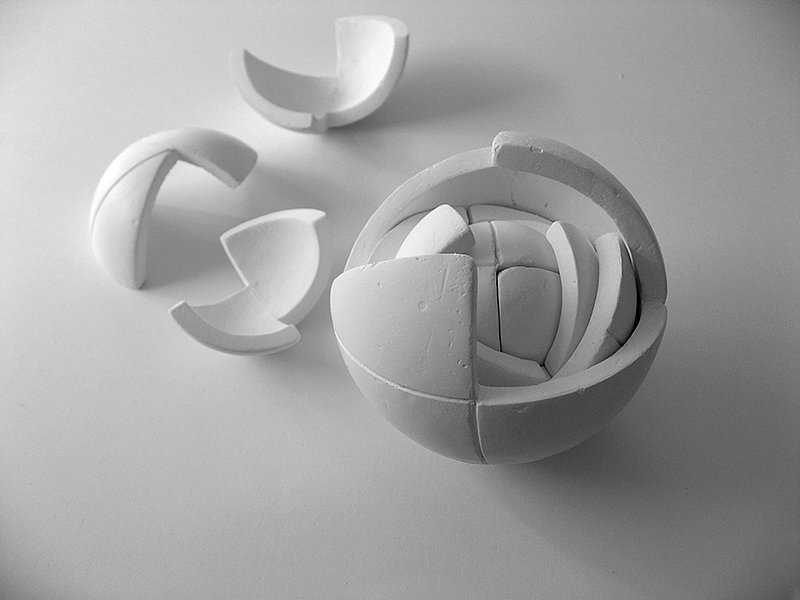 The ball may then be reassembled in a similar fashion. For all ages the object teaches spatial geometry and fine motor skills, exercising and training the three muscle groups necessary for writing and drawing and hand-eye coordination: fingers and hand for grasping, index finger and thumb for pinching, and wrist for rotation. The word innovation does not necessarily mean the creation of a toy packed with technology and digital components. Although we live in an age where new digital toys are released every day, there is a clear gap in the market for a contemporary 3-D toy that can offer a tactile, memorable experience. Such a toy must engage children on an emotional level, encouraging their growth through the development of investigative skills and a curiosity to discover the surrounding world. The curious challenge ideal for growing minds! OBLO is both a tactile and mental toy. As children construct and deconstruct its parts, OBLO helps develop their fine motor, visual processing and logical thinking skills. As they use both of their hands to manipulate the puzzle, it is also a great preparation for learning to write and draw. Fine motor - coordination of small muscle movements which occur in body parts such as the fingers and hand, usually in coordination with the eyes. This skill is needed in order to write, draw, pull, press etc. Visual Processing - help children to understand what they see, recognize and identify different qualities that help them judge size, color, shape, spatial relations, and other things. Logical Thinking - the process in which reasoning is used consistently in order to come to a conclusion. Reasonable, reflective thinking is aimed at deciding what to believe or what to do. „Whenever another juror picked up this fascinating toy, we could observe continuous streams of smiles and intense mental concentration. 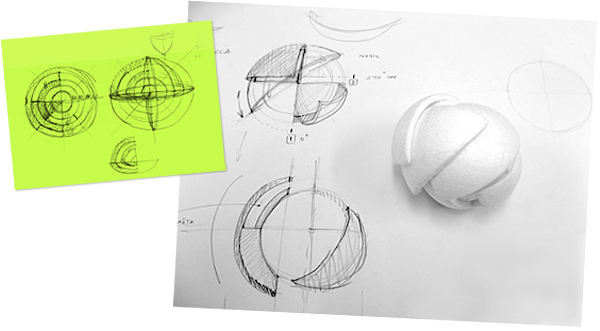 The design engages in a way that few toys (for children or adults) are capable of. This is a world‐class design achievement." Interested in Sales and Distribution? GCW is a Toronto‐based privately held corporation that develops, manufactures and sells sporting goods and educational toys. GCW also produces and distributes Logiq Tower™ puzzle and world‐renowned Zipfy Mini Luge snow sleds. EN Oblo is an award winning 3-D spherical puzzle that both challenges and inspires children of all ages. 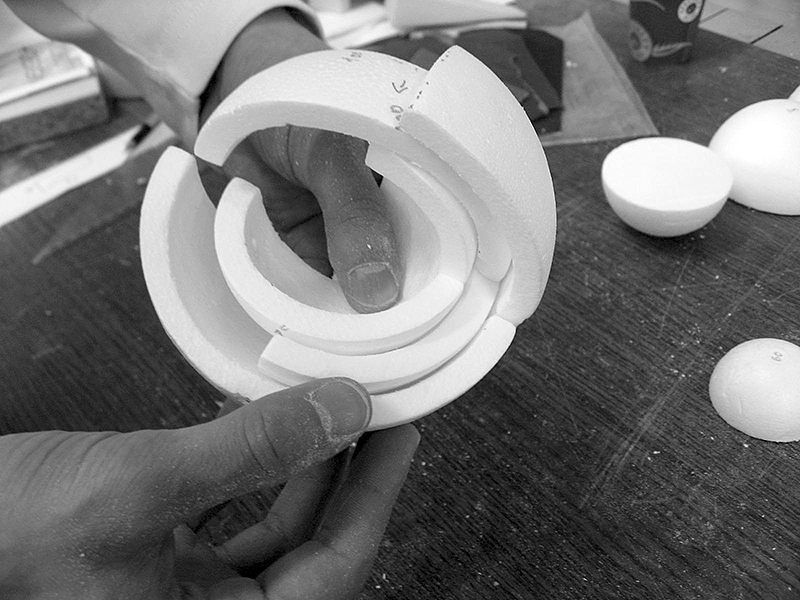 To graduate from one layer to the next, users must find the correct position for each piece in order to progressively build spheres within spheres. Designed in Croatia. Made in China. FR Oblo est un casse-tête tridimensionnel composé de sphères, c’est un veritable défi qui attend les joueurs de tous les ages. Le principe: différentes couches colorées qui s’emboîtent les unes dans les autres. La position correcte pour chaque morceau permet progressivement de construire des sphères dans des sphères. Conçu en Croatie. Fait au Chine. ES Oblo es un rompecabezas tridimensional compuesto de esferas. Es un verdadero desafío para los niños de todas las edades. Para pasar de una capa para la siguiente, los usuarios deben encontrar la posición correcta de cada pieza con el fin de construir progresivamente las esferas dentro de las esferas. Diseñado en Croacia. Hecho en China. DE Zum Oblo ist ein preisgekröntes 3-D-sphärischen Rätsel, das sowohl Herausforderungen als auch begeistert Kinder aller Altersklassen. Für den Fortschritt von einer Ebene zur nächsten, müssen die Benutzer finden sie die richtige Position für jedes Stück zu bauen schrittweise kugeln mit kugeln. Konzipiert in Kroatien. Hergestellt in China. IT Oblo è un puzzle sferico 3D vincitore di molteplici premi, che sfida e ispira bambini di tutte le età. Passando da uno strato all’altro, gli utenti devono trovare la corretta posizione di ogni pezzo per poter progredire ad un livello superiore costruendo progressivamente delle sfere all’interno di altre sfere. Progettato in Croazia. Prodotto in Cina. PT Oblo é um premiado 3-D esférica puzzle que ambos os desafios e inspira as crianças de todas as idades. A evolução de uma camada para o próximo, os utilizadores devem poder encontrar a posição correcta para cada peça progressivamente a criar esferas em esferas. Projetado na Croácia. Fabricado no China. HR Oblo je nagrađivana trodimenzionalna kuglasta slagalica koja predstavlja izazov i potiče djecu različitog uzrasta. Igrač mora pronaći ispravan položaj za svaki dio, kako bi se napredovalo iz jednog nivoa u drugi, odnosno kako bi se postupno gradile sfere unutar sfera. Oblikovano u Hrvatskoj. Proizvedeno u Kini. 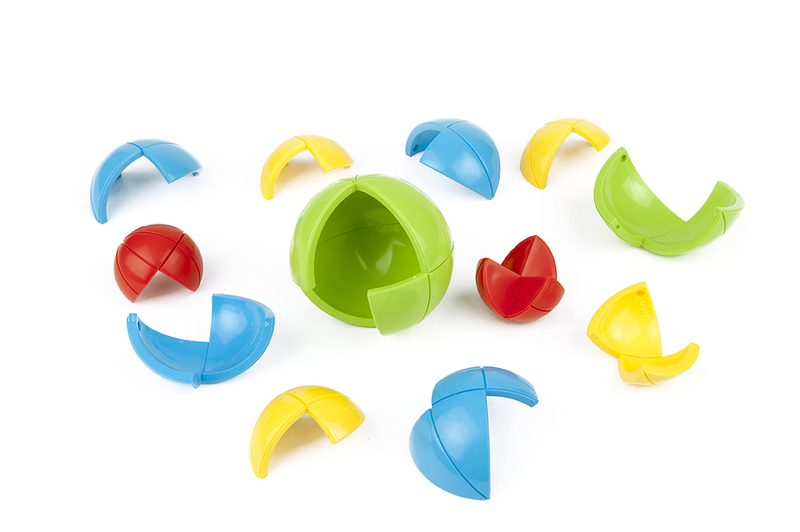 OBLO™ spheres helps developing fine motor, visual processing and logical thinking skills of preschool children. Size: 83 mm (3.3") Dia.